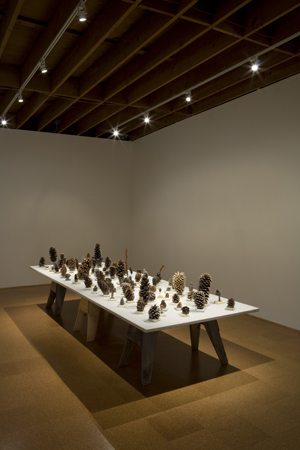 I Wish I Could Say What I Feel, Installation view, Steve Turner Contemporary, April 2010. 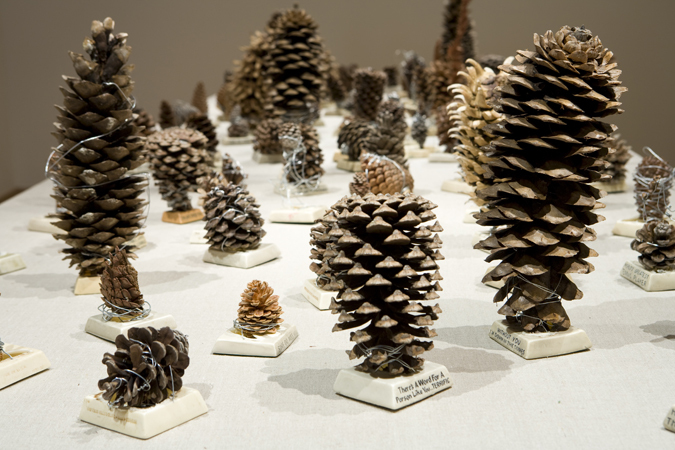 Pine cone series no. 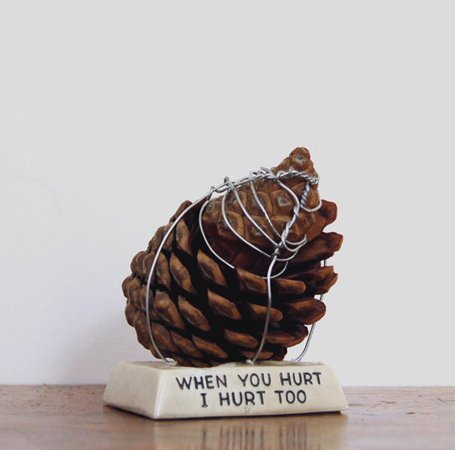 25 (When you hurt I hurt too), 2010. 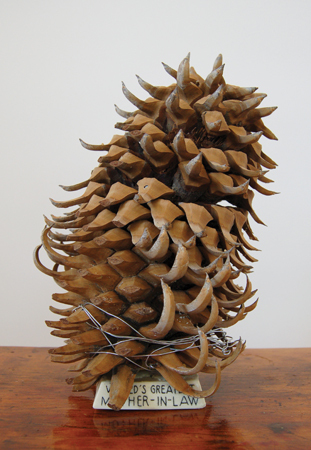 Pine cone, steel wire and sillisculpt resin base, 4 1/4 x 3 1/2 x 3 1/2 inches. Pine cone series no. 36 (You tempt me! ), 2010. 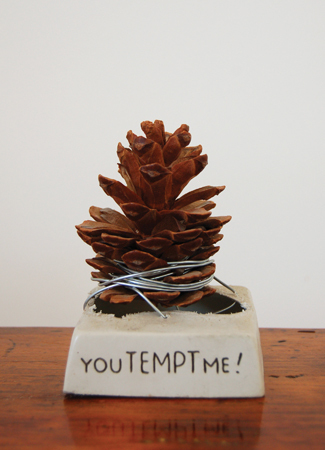 Pine cone, steel wire and sillisculpt resin base, 4 x 2 1/4 x 2 1/4 inches. 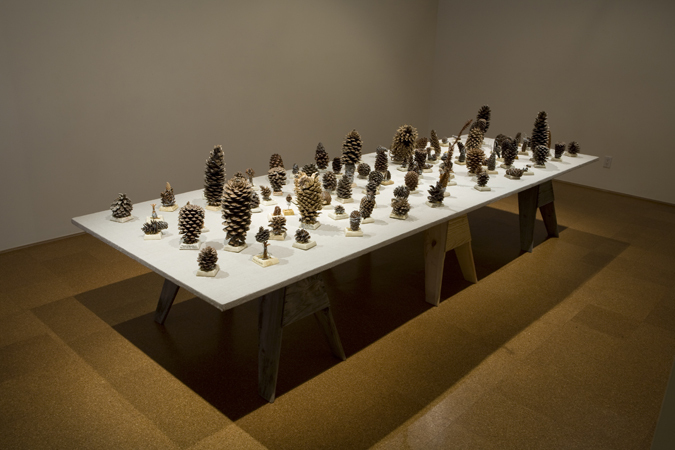 Pine cone series no. 18 (World's greatest mother-in-law), 2010. Pine cone, steel wire and sillisculpt resin base, 11 3/4 x 8 x 8 inches. Steve Turner Contemporary is pleased to present I Wish I Could Say What I Feel, a solo exhibition featuring sculpture by the Los Angeles-based artist Michael Decker. 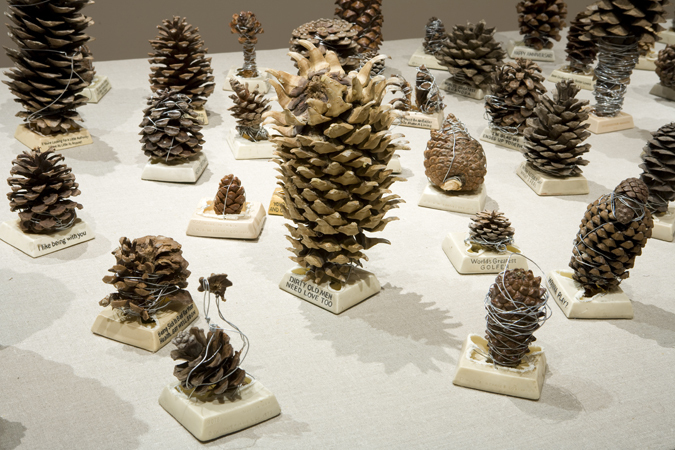 The artist’s debut at the gallery consists of one hundred works that combine two of his collections: pine cones and Russ Berrie’s “Sillisculpts,” original resin figurines, produced in the 1960s, 70s, and 80s, that combined quaint, saccharine sentiments with a caricatured figure. Popular statements such as “I wish I could say how I feel” and “When you hurt I hurt too” were inscribed on a base and topped by a doughy figure exaggerating the written message; Decker found these knickknacks during excursions to thrift stores. He has combined the Sillisculpts and pine cones by removing the Sillisculpt figure from its base, replacing it with a pine cone that is bound to its pedestal with steel wire. In replacing the cloying, tacky figure with something from the natural world, Decker has gone from the ridiculous to the sublime: mawkish, human sentiments now compete with the power of a natural object. 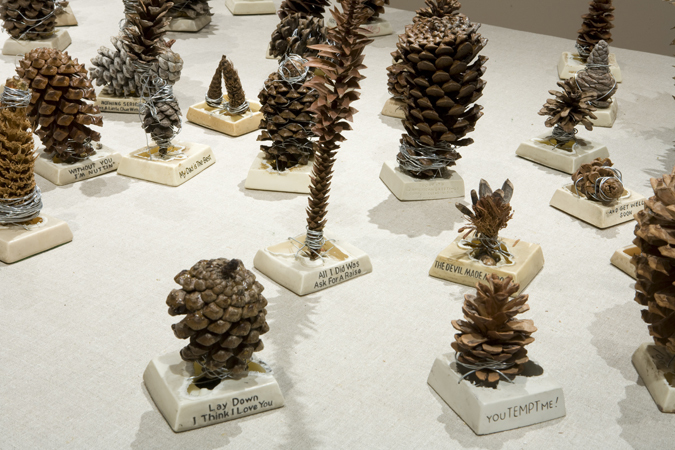 Decker’s witty juxtaposition creates an entirely new reading in which the kitschy sentiments and the natural pine cones symbolize, with all its implications, the gulf between the man-made world and the natural one. Born in Spokane in 1982, Michael Decker received a BFA from the California Institute of the Arts (2005). He has had solo exhibitions at Dan Graham Gallery, Los Angeles (2010) and Circus Gallery, Los Angeles (2009). He lives and works in Los Angeles.